The Walking Dead is back. It did not disappoint. “Seed” showed the gang with an all new alternative for survival. It seems that the characters have been in survival mode throughout the winter time and it shows in their physical appearances. Carl has longer hair. Herschel has a full beard. Most importantly, Lori looks to be expecting any day now. In this episode we see Rick as the head honcho, calling the shots, and keeping the group in order. While the group is exhausted from all of the traveling, it is certain that they need a place to stay. Luckily for Rick he finds one. The problem that lies ahead for group though, is that the prison they are trying to relocate in is infested with zombies. What makes “The Walking Dead” full of intrigue is not only the gory zombies and the thrill of survival during a zombie apocalypse, it is the development of the characters who have survived thus far. They’ve just changed so much from the first time we met them. Rick’s new attitude is absolutely compelling. His role as the leader keeps you glued to the television because his plan is surviving. He is similar to a general that is strategic, and gutsy. Believe it or not Carl is actually likeable in this episode. It seems that Rick taught him plenty while they were trying to move on and survive. Carl seems to have improved on his shooting skills, and is no longer hesitant and afraid like he was in the previous season. The same can be said for Carol. The rest of the crew have seemed to stick by Rick. It shows by how much more ruthless and less argumentative they can be. We do get introduced to a new character in Michone, who in last season’s finale was shown in a hoodie and by her side were two armless chained up zombies. Although we don’t see much of Michone in this episode, her character seems to be kind-hearted as she takes care of Andrea who looks to be sick and weak. Andrea is still very stubborn and unlikeable. She is ungrateful for being cared for and it clearly shows in the minimal screen time she had on this episode. There are a few moments throughout, where character developments could take place. One involves Daryl and Carol in what could be a future love interest they have together. Meanwhile Rick and the others look to explore more of the prison. They find some guns and ammunition, then decide to explore the cafeteria for food. While they walk through the dark hallways of the prison, they find more zombies and unfortunately one of the members become a victim to a ferocious bite. In this premiere there was a ton of action in terms of zombies getting shot, sliced, and stabbed. “Seed” is one of those episodes where tension, excitement and fear are all intertwined while you anticipate with fright on what will happen next. This premiere was one of the best in “The Walking Dead” series thus far. The plot lines seem solid, the characters are tremendous; it looks like this season will keep you focused and interested along with the introduction to new locations and characters along the way. Overall, “The Walking Dead” gets off to a tremendous start, and each week you could guarantee that there will blood, gore, and ruthless zombie deaths that will take place. Survival is the only option during this zombie infested plague. You either are the hunter or the hunted. Anticipation of “The Walking Dead” premiere has been higher this season than it has been for previous ones. Year two ended with Rick’s (Andrew Lincoln) statement that the group is no longer a democracy; he now runs the show- it is leave or follow. Within the first two scenes it is evident that his claim has clearly been enforced. This newest season takes place in the springtime. With winter past and the notion mentioned in season two about the dead not surviving the cold thrown out the window, the gang of survivors are haggard, tired and on the run, also Lori (Sarah Wayne Callies) is now close to nine months pregnant. The survivors are looking for a place to settle down, having run the whole winter from the bloodthirsty undead. Series creator Frank Derebont’s claims of this season’s start to be more face-paced and violent prove to be true. Where the first half season last year dragged on before the mid-season finale, season three is full of zombie smashing fun. Decapitation, laceration, dismemberment, arrows and the trusty head shot have all been called in to play with some walkers. 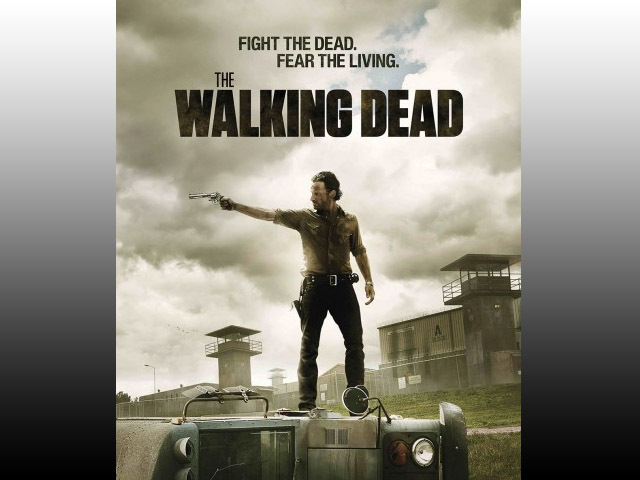 What makes The Walking Dead compel its viewers is the human element, resentment towards the group by Rick, Lori’s desire to have her family back, her hormones in constant flux from her pregnancy and the group’s fear of their leader. Unfortunately for everyone in anticipation, the premier episode doesn’t focus too much on Michonne (Danai Gurira) or her two pet walkers, but her face is finally revealed. The sound and camera angles set the scenes bringing the true drama to the surface even when there is complete silence. The world truly feels as though it has been abandoned by the living. Even in the dark the use of flashlights and natural light embrace the confinements never letting the viewer feel confused as to how the group or the walkers ended up in a certain situation. Fears for survival of are brought to the forefront of this premier. Relationships of the survivors starting to take shape and an ending that had fans in shouts of glee all over social media; this is why we watch television. We want to get immersed into a world filled with zombies, adventure and constant struggles for survival. The Walking Dead delivers what we all tuned in to see, entertainment.